B&N/Nook Media wasn't the only company to announce major self-publishing news today. The online ebook creation service Pressbooks has just signed their second distribution deal. Authors can now use Pressbooks to format and create an Epub ebook, and once they're done they can upload the ebook to BookBaby. Creating the ebook is of course still free (for a limited number of titles), but authors will have to pay BookBaby's $99 flat fee to distribute the ebook. BookBaby currently distributes to 11 different ebooks stores around the world, including Kindle, Kobo, Nook, and iBooks. We found when we were directly involved in distribution, we were just sitting in the middle between authors, our distribution partner, and retailers … taking a cut for essentially being in the way. Rather than add cost, Pressbooks decided to get out of the way and focus more of their attention on adding value by improving the service. For more details, visit Pressbooks or Bookbaby. Anyway, our preference is to focus on what we’re good at: making books. And let others worry about the headaches of distribution. Thanks for the details, Hugh. I was going to send you an email and ask about that, I swear. This isn’t a recent development. They’ve listed BookBaby on their site for some time now. What has changed? They announced it yesterday. I didn’t realize it was old. 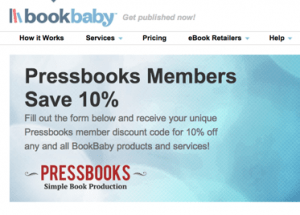 In looking further at their site, the Bookbaby connection is more integrated into the Pressbooks menu. Before they simply listed Bookbaby as a provider. The current press release is the first I’ve seen publicly announcing the connection but I saw it weeks ago while exploring their site. @eliott, we previously just had a link from the main page with a code…but we’ve “officialized” the agreement, with links from inside the PB interface to a BB/pressbooks page.